A reader sent me an article entitle "Raised Bar Pays Off For UDM Law Grads" about how the University of Detroit Mercy School of Law has transformed itself to defy the U.S. News rankings and at the same time make itself more attractive to Big Law. They have done so by ignoring the ranking system and by focusing on a "real-world, hands-on approach" to legal education. How did this come about? Well -- this is unusual in two respects -- the new dean asked the students what they wanted. Now, this is different because the school (1) actually asked the students and, more importantly, (2) they listen to what they were saying and acted upon it. What the students told him was that they wanted "more practical training". Many law schools pretend to ask students what they want in a legal education, but few actually intend to take dramatic steps to do so. This honest conversation with their students required UDM to completely retrofit their curriculum. The result is that law firms not only now know of the school, but they are motivated to hire UDM grads. As it turns out, law firms in general, and particularly Big Law also want to hire attorneys with practical knowledge. UDM has retooled its curriculum by tripling the number of opportunities to expose students to real-world training. Each student is now required to work with clients before graduation. Few other law school in the country requires this. 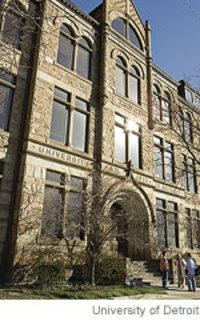 UDM has the nation's only mobile law office. It has opened a veterans' clinic. It also has appellate, mediation, urban and immigration clinics. Now, I know a lot of other law schools have clinics, but these clinics need to be and operate as real law firms. Not just advice mills with little or no credit to be applied toward graduation. Third-year students now are required to participate in a mock law firm program where they simulate the complex transactions involved in major business deals. And all of this retooling seems to have many more practical effects. For one, for the first time since February 2004, UDM students passed the Michigan bar exam at a higher rate than the state average for first-time test takers. It even surpassed the University of Michigan. And, this seems to be having an effect on recruitment. Where the number of law school applicants dropped 15.7 percent nationally over three years, applications to UDM jumped more than 20 percent. We all need to start insisting that our law schools begin following UDM's lead.